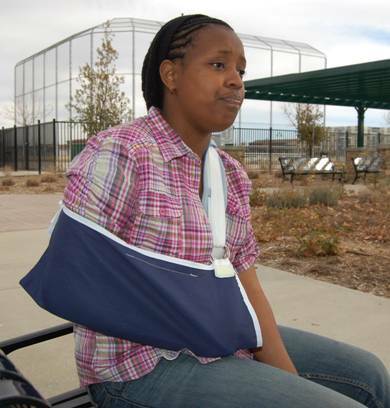 N. Wise claims she was roughed up and choked by deputies on Jan. 11. 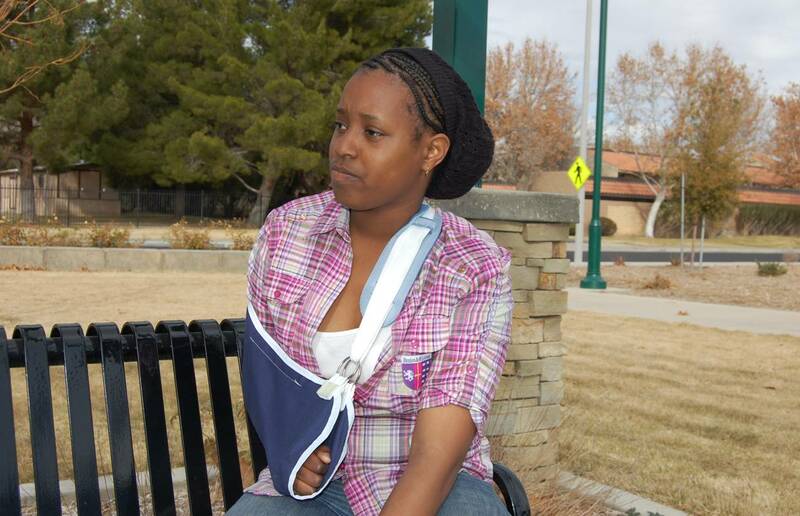 She says the incident left her with severe shoulder strain, and doctors put her arm in a sling. LANCASTER – Allegations of brutality against a 20-year-old woman who claims she was roughed up and choked by deputies during a traffic stop last week are being investigated by the Los Angeles County Sheriff’s Department’s Lancaster Station. The complaint was reported around 10 p.m. Wednesday, Jan. 11, by N. Wise (who did not want to use her first name.) Wise also produced medical reports from the Antelope Valley Hospital created the morning after the incident, which stated she had contusions, shoulder strain, and an inflammation of the cartilage that attaches the ribs to the breast bone. Wise claims she suffered those injuries at the hands of deputies. Wise claims these contusions to her back occured when she was forcefully restrained by deputies. She says the incident began around 8 p.m., Wednesday, Jan. 11. Wise says she was riding a bicycle on West Avenue I, near 15th Street West – on her way home from a friend’s house – when a car pulled up behind her and immediately shut its lights off. “I see a cop popping out the car before the car even fully stops; he asked me where I am headed,” said Wise. She alleges the deputy, Jeremy Esswein, demanded she get off the bicycle and forced her hands behind her back. Wise says she was having difficulty breathing because her asthma was acting up due to the stress of the situation. Wise said the deputy asked her if she had any warrants on her or if she was on probation, and she told him she had never been in trouble and this was her first encounter with law enforcement. She said she tried to raise her head, and that’s when the other deputy, Curtis Foster, put her in a headlock. Wise said, at this point, she was crying hysterically. She said both deputies dragged her to the curb and forcefully restrained her until back-up arrived. Wise said she obtained this bruise by her armpit when deputies forced her onto the curb. Wise maintains that she was not fighting back, only screaming in pain. She said this continued until more deputies arrived on the scene. “It was like five cop cars that came up and probably like six or seven cops,” Wise said. She said she informed one of the female deputies that she was crying because she had been pulled over without cause and she had been choked. Wise said that’s when the officer informed her that she had been pulled over because she had no light on her bicycle. She said she was searched by two officers. Wise said she had to remove her shoes during the search, and then was placed in a patrol car, without shoes, while deputies searched her background. Wise was eventually ticketed for not having a light on her bicycle and not having valid identification. 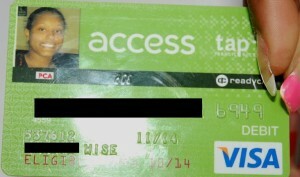 Wise, who does not own a driver’s license, said she produced an Access Card, with her name and photo, but the card was not deemed valid identification. Wise says her Access Card was not deemed a valid ID, so she was ticketed for having no valid identification. Wise estimates she was detained for about an hour, and says after calming down she headed to the Lancaster Station to file a complaint. “I feel as if I was targeted because I was Black,” Wise said. Tuesday, Lancaster Sheriff’s spokesman Michael Rust emphatically denied that deputies participate in racial profiling. Rust said he couldn’t speak specifically about the contents of Wise’s complaint because the matter was being investigated, but he could speak to the procedures that deputies follow during a traffic stop. “The allegations that she is making is totally not procedure-wise,” Rust said. Rust said Wise’s circumstances gave deputies probable cause for the traffic stop, and she was legally detained for her bicycle violation. Rust said Wise’s failure to produce valid identification may have aroused further suspicion. Rust said Wise may have aroused suspicions because she was riding a bike at night in a bad part of town, with no light on the bike and no ID. Rust said it’s not unusual for a person to be handcuffed during a traffic stop. Rust said a person could get injured as deputies try to control a situation. Rust said he has never witnessed an incident of deputy abuse. “I can’t say we don’t, but I have never witnessed it,” he said. Rust said Wise’s allegations of deputy brutality will be investigated at the station level first. Depending on what is found, the complaint could be routed to the Sheriff’s Department’s Internal Affairs Bureau. The two deputies named in Wise’s complaint, Jeremy Esswein and Curtis Foster, are also named in a civil lawsuit against the Los Angeles County Sheriff’s Department. In the civil lawsuit, Lancaster resident Marco Chiclana claims he was excessively beaten by Esswein, Foster and four other deputies on April 2, 2011 in front of Antelope Valley Hospital. Read more on that lawsuit here. 19 comments for "Woman alleges deputy brutality"
IS IT NOT SAFE FOR ANYONE TO RIDE A BIKE HERE IN LANCASTER ANYMORE? WELL I’D LIKE TO KNOW HOW THEY WOULD FEEL IF ONE OF THEIR RELATIVES GOT SHOT JUST FOR NO BIKE LIGHT !! THIS GIRL, SHOULD NOT HAVE BEEN RUFFED UP LIKE THAT, AND SHE SHOULD PROSECUTE TO THE FULLEST!! THESE CRIMINALS WORKING AS DEPUTIES SHOULD BE IN JAIL!!!! YES SOMEONE NEEDS TO POLICE THE POLICE! THEY ARE OUT OF CONTROL! THIS WOMEN IS LUCKY SE DIDNT GET SHOT BY THEM, AFTER ALL THEY SHOT THAT GUY JUST A COUPLE OF WEEKS AGO, FOR WHAT OHYEA NO BIKE LIGHT!!!!! SOMEBODY NEEDS TO STOP THEM!!! To those that feel harrassed by the sheriffs,there is a number in the pennysaver asking if u have been harassed call a certain number…. Now that they’ve gotten rid of gang members, they’re going after young folks on bikes? They shot a young man last night, 8 times in the back, per his parents. Damn bike riders! no offense,well if so then why do you defend so intensely the corruption of cops makes no sense you obviously are getting paid to be on there side, so you too are as bad and as dirty as cops and their corruption. if you are a Detective you should know that the evidence is more important in cases so whats more better then a video like in the Chiclana case. and a coincidence that the same officers were in the Wise case! but like i said the only one that will benefit from all this evidence and proof that all officers involved in the Chiclana and the Wise case they will be held to answer to their action’s. the they took a oath to protect and serve not beat and lie! These were the same two deputies involved in the controversial fight at AVH. That warrants investigation. As to whether or not this second case was also abuse or not, we’ll have to see what the investigation turns up. I would say overall, that most of the deputies out here do a fantastic job. But like any organization, you always have a few bad eggs that have to be weeded out. What was most telling was Deputy Rust’s description of that part of Lancaster as being a bad area and full of crime. This comes on the heels of King Rex proclaiming that Lancaster is a safe city. I would love to see him walk down there around midnight on a Saturday night without his body guards. LASD get their orders from Sheriff Lee Baca in Los Angeles, not Mayor Parris or Mayor Ledford. If you’re going to complain about the system, at least try to sound somewhat educated. Talking about the “Grand W.” (obvious klan reference) makes you sound stupid and foolish. Are you going to call Baca (Hispanic) a “Grand Wizard” too? get real! yeah thats it! Anyone who doesnt believe in your pubescent conspiracy theories “must be on Rex’s payroll”. do you realize how dumb you sound? Actually the LASD Lancaster Station Captain takes order from the Lancaster City Manager and the Captain at the Palmdale Station takes orders from the Palmdale City Manager. At least that’s what the top brass at the Sheriff’s Dept. said at the last townhall meeting anyway. He said ultimately the City contracts with the County Sheriff’s Dept. for law enforcement services, so therefore the heads of the local law enforcement answer to the City Managers. I guess this would mean if you have a problem with how Lancaster deputies do their job, take it up with Bozigian not Baca. This newspaper seems to enjoy printing any story that makes law enforcement look bad. and you automatically take the side of the so called “victim”. this paper has become a tool for local marxists/communists! I bet the owner/publisher of this newspaper has never walked a single day in a sherrifs shoes, they just exist to criticize them. Get an Attorney Girl. I love law enforcement, I am not too keen on ruffing up females. A bike light? Come now, drug dealer, threat? Too many examples that someone is approving this activity? The spokesman is not helping matters. “No comment” sounds better than condoning bad acts. To all good AV Law Enforcement, keep up the good work. Holla at the bad-apples and put a little peer pressure on them PLEASE!!! Does it surprise me that these two deputies were also involved in the Chiclana incident? No. SOMEONE needs to hold the LA County Sheriffs responsible accountable for the actions before the citizens start to do it themselves! This is ridiculous!